Wow! It has been a long time since I blogged. I started a new job at Irrive (create your own social scrapbook for life’s adventures!) and have been a bit busy. Plus, I definitely got into a cooking rut — was feeling uninspired. Then, summer came and we did a lot of very simple grilling. Nothing that exciting to blog about. But as a crispness returns to the air and fall approaches, I’m excited to make stews and soups and heartier fare! 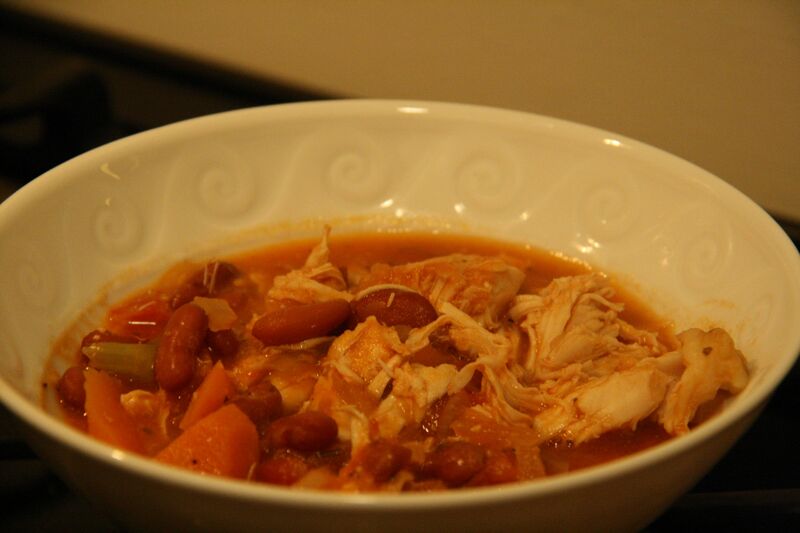 On the eve of Charlotte’s first day of preschool, I made Giada’s delicious chicken stew. The ingredients are super simple, but come together beautifully. Even Charlotte liked it (or at least the beans and tomatoes). I used Italian seasoning instead of basil, thyme, and a bay leaf, but otherwise followed the recipe as written. Have some crusty bread on hand and don’t forget it tastes even better the next day! Heat the oil in a heavy 5 1/2-quart saucepan over medium heat. Add the celery, carrot, and onion. Saute the vegetables until the onion is translucent, about 5 minutes. Season with salt and pepper, to taste. Stir in the tomatoes with their juices, chicken broth, basil, tomato paste, bay leaf, and thyme. Add the chicken breasts; press to submerge. Bring the cooking liquid to a simmer. Reduce the heat to medium-low and simmer gently uncovered until the chicken is almost cooked through, turning the chicken breasts over and stirring the mixture occasionally, about 25 minutes. Using tongs, transfer the chicken breasts to a work surface and cool for 5 minutes. Discard the bay leaf. Add the kidney beans to the pot and simmer until the liquid has reduced into a stew consistency, about 10 minutes. Discard the skin and bones from the chicken breasts. Shred or cut the chicken into bite- size pieces. Return the chicken meat to the stew. Bring the stew just to a simmer. Season with salt and pepper, to taste. Ladle the stew into serving bowls and serve with the bread. Tim loves Indian food, but I never cook it for him. It’s not that I dislike Indian food. It just doesn’t come to mind when I’m contemplating what to cook. As a treat for Tim, I decided to try this quick chicken vindaloo — a spicy tomato-based dish — from Fine Cooking. It was super easy to make and packed with flavor! I used diced tomatoes with chiles for a little added punch. 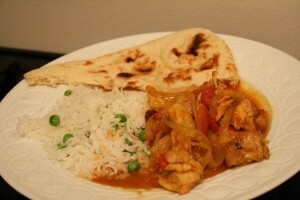 I served the vindaloo with frozen naan from Trader Joe’s and basmati rice with peas. I will definitely make this again! Scored some major brownie points with Tim. And, I really enjoyed the meal! In a small bowl, stir the curry powder, paprika, and 3/4 tsp. black pepper. Put the chicken in a medium nonreactive bowl, sprinkle with 1 Tbs. of the curry powder mixture, about half of the garlic, 2 Tbs. of the vinegar, and 3/4 tsp. salt; toss to coat. Set aside at room temperature. Heat the oil in a 10- to 11-inch straight-sided sauté pan over high heat until shimmering. Add the onion and ¼ tsp. salt and cook, stirring occasionally with a wooden spoon, until it softens and begins to brown around the edges, 4 to 5 minutes. Reduce the heat to medium high, add the ginger, the remaining garlic, and the remaining curry powder mixture and cook, stirring, until fragrant and well combined, about 45 seconds. Add the tomatoes and mix to combine, scraping the bottom of the pan with the spoon. Stir in the chicken, reserved tomato juice, remaining 2 Tbs. vinegar, and 2/3 cup water. Bring to a boil, cover partially, reduce the heat to medium, and simmer, stirring occasionally, until the chicken is tender and cooked through, 15 to 20 minutes. Season to taste with salt and pepper. Serve sprinkled with the cilantro. I usually think of chicken and eggplant parmesan as having lots of steps and taking a while to prepare. 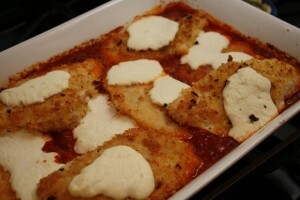 Here is a delicious short-cut version of chicken parmesan perfect for a weeknight! The two keys to this recipes are: 1) thin chicken cutlets; 2) high quality jarred marinara. The thin cutlets cook up quickly and a good marinara just makes the dish so much tastier! I actually forgot to buy the mozzarella so I put dollops of ricotta on top of the cutlets. Delicious and a change of pace from your typical parmesan. By the way, this is another recipe from Real Simple’s: Dinner Done Right. Definitely got my money’s worth out of that checkout line purchase! Heat oven to 400º F. Season the chicken with ½ teaspoon salt and ¼ teaspoon pepper. Place the flour and eggs in separate shallow bowls; in a third shallow bowl, combine the bread crumbs and Parmesan. Coat the chicken with the flour, then dip in the eggs (letting any excess drip off), then coat with the bread crumb mixture, pressing gently to help it adhere. Heat the oil in a large skillet over medium-high heat. Cook the chicken in batches until golden brown, about 2 minutes per side. Pour the marinara sauce into a large, shallow baking dish. Top with the chicken and mozzarella. Bake until bubbling and golden brown, 20 to 25 minutes. 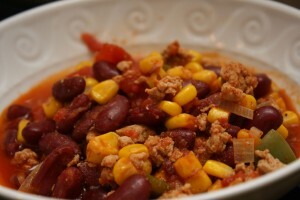 As you have probably surmised by now, I love chili! The other day I wanted to make a chili that Charlotte could try; so, my go-to turkey chili which is super spicy did not fit the bill. I found this recipe in my new Real Simple cookbook and it was a hit! Much milder than what I usually cook which was perfect for Charlotte. And, I just needed to add a few dashes of Cholula to my bowl for a bit of a kick. The recipe seem very heavy on the beans relative to the turkey — it calls for 1/2 pound of ground turkey and 2 cans of kidney beans. I upped the turkey to 1 pound. If you increase the turkey to a full pound, you might up the chili powder and cumin a bit. In the last few minutes of cooking, I added frozen corn for some color, crunch, and additional flavor. Serve with avocado, shredded cheese, and sour cream. Overall, the chili was tasty and a nice change of pace from my usual turkey chili. Heat the oil in a large saucepan over medium-high heat. Add the onion, bell pepper, and garlic. Cook, stirring occasionally, until tender, 4 to 6 minutes. Add the turkey and cook, breaking up with a spoon, until no longer pink, 3 to 5 minutes. Stir in the tomato paste, cumin, and chili pepper. Cook, stirring, for 1 minute. Add the tomatoes and their juices, beans, ½ cup water, 1 ¼ teaspoons salt, and ¼ teaspoon pepper. Bring to a boil. Reduce heat and simmer, stirring occasionally, until slightly thickened, 12 to 15 minutes. Serve the chili with the sour cream and cilantro. First of all, this recipe is MUCH more delicious than the photo makes it appear. The dish is basically a quick version of traditional sausage and peppers which I love. The pickled cherry peppers and their juice add a great flavor; as did the hot Italian sausage I used. If you wanted to lighten the dish up more, you could use turkey sausage rather than pork sausage. Serve with some crusty bread or some sliced polenta for an easy weeknight meal! Heat 1 tablespoon butter in a large skillet over medium-high heat. Cook the sausage until golden, about 2 minutes. Season the chicken with salt and pepper, then toss with the flour in a bowl; add to the skillet and cook until browned but not cooked through, about 3 minutes. Add the onion, peppers, garlic, 1/2 teaspoon salt, and pepper to taste and cook 3 minutes. Add the wine, scraping up any browned bits; bring to a boil and cook until slightly reduced, about 1 minute. Add the broth and bring to a gentle simmer. Cover and cook until the sausage and chicken are cooked through, about 5 minutes. Transfer the chicken, sausage and vegetables to a platter with a slotted spoon. Increase the heat to high and stir the parsley and cherry peppers and their liquid into the skillet; boil until reduced by one-third, 2 to 3 minutes. Remove from the heat and stir in the remaining 1 tablespoon butter. Pour the sauce over the chicken mixture. Autumn feelings and autumn sights. Afternoons so bright and bold. These are two lines of a poem I wrote in the fifth grade. I can’t remember the rest of the poem but I always think of these lines as soon as there is a chill and crispness to the air. (Yes – it’s quite dorky that I can remember something from Indian Hill School.) There is a distinct feeling I get when fall arrives and I start to crave a different type of food — heartier, more comforting. Here is a great weeknight dish using a wonderful fall / winter green — kale! I tried to make the recipe healthier using whole wheat pasta and turkey sausage. 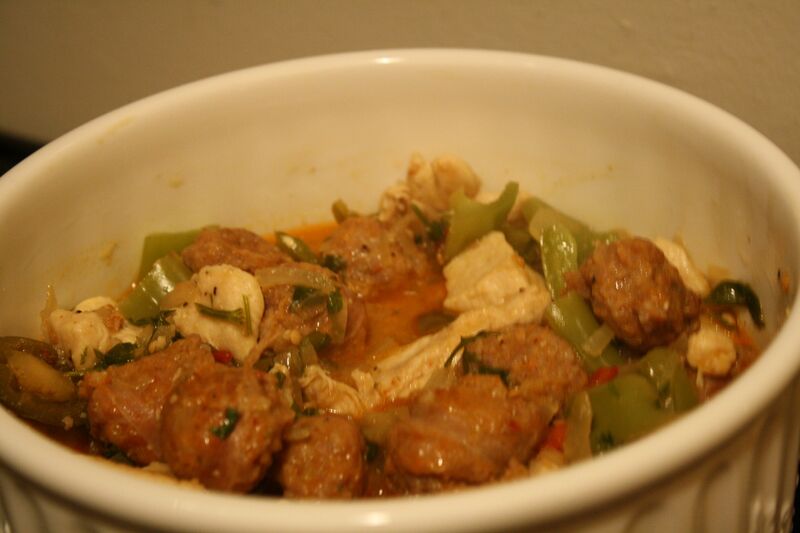 The spicy sausage, cheese, and broth all lend great flavor to the dish. If you don’t like spicy food, sweet turkey sausage would be delicious as well. I used pine nuts in the recipe but I don’t think they add a ton to the dish. So, if you don’t have them on hand or don’t eat nuts, just omit them. The pasta will be tasty without them. The recipe as written will make 4 servings. I’m already planning to eat some leftovers for dinner tomorrow night when Tim has class. Heat a large pot of salted water to boiling and cook the pasta according to package directions. Drain and reserve 1/2 cup of the pasta water. Return the pasta to the pot and set aside. Heat a large sauté pan over medium high heat with a drizzle of olive oil. When hot, add the sausage and cook until browned. Add the kale to the pan. Pour the chicken broth in, cover, and cook for about 8 minutes, or until the kale is wilted and tender. 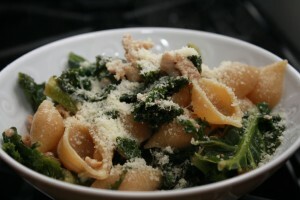 Add kale-sausage mixture, pine-nuts, cheese, and reserved 1/2 cup of pasta water into the cooked pasta. Serve with additional cheese. I must say I was a little surprised to see Gwyneth Paltrow on the cover of Bon Appetit the other month. Obviously, her image has graced countless magazine covers but, after her macrobiotic phase, I typically don’t associate her with delicious food. But she has recently written a cookbook entitled My Father’s Daughter (which Bon Appetit reviewed quite favorably), filmed a PBS show eating and touring in Spain with Mario Batali, and regularly posts recipes on her blog Goop.I read the Bon Appetit article and recipes — they actually looked quite appealing! She is no longer a vegan and has found a happy medium cooking healthfully but not sacrificing flavor or the occasional indulgence. I cooked this grilled chicken recipe and I must say the barbecue sauce was packed with flavor and had quite a kick from the chipotle peppers in adobo sauce. My main criticism of the dish is that boneless skinless breasts can get dry on the grill. I have found the best way to grill any chicken is to marinate it in a dry rub and to then add the sauce while grilling. The chicken remains moist and doesn’t char. I really did love this barbecue sauce so I do plan to make it again but next time I will use skin-on, bone-in breasts and use a rub before applying the sauce to the chicken. The sauce would also be delicious on grilled bone-in pork chops. Again, I would do some sort of rub before grilling the pork. Gwyneth’s halibut and roasted pasta recipes definitely called out to me so I might have to try those as well! Combine first 5 ingredients in a small saucepan. Season lightly with salt and pepper and bring to a boil over high heat. Reduce heat to low; simmer until peaches are very soft and flavors meld, about 10 minutes. Remove pan from heat; let cool. Pour peach mixture into a blender and purée until smooth. Season to taste with salt and pepper. Place half the sauce in a medium bowl; add the chicken and turn to coat. Let marinate at room temperature for 20 minutes, or cover and chill for up to 8 hours, turning occasionally. Cover and refrigerate remaining sauce. Prepare a grill to medium-high heat. Brush grill rack with oil. Grill chicken until browned and almost cooked through, 4-5 minutes per side. Brush on all sides with reserved sauce; grill until glazed and cooked through, 1-2 minutes per side. Slice crosswise. Serve remaining sauce alongside. I bought some beautiful red bell peppers and zucchini balls at the farmer’s market. 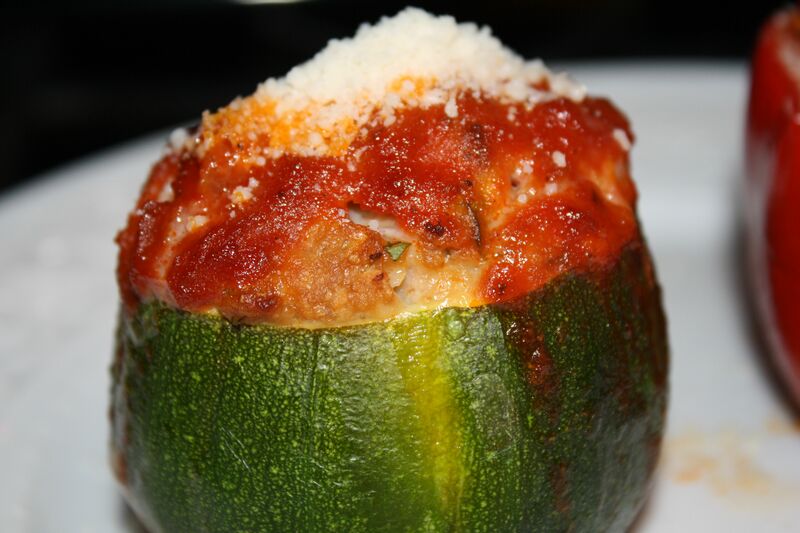 The zucchini ball seemed perfect for stuffing so I search for a stuffed pepper / zucchini recipe. My challenge was to find a recipe that did not involve rice or a grain as Tim and I were cutting down on the carbs. I found this Giada recipe, which uses ground turkey, that fit the bill! The dish tasted like a delicious meatball inside the baked vegetable. I loved it — so flavorful! Plus, without the rice to cook and with the store-bought marinara (I used Rao’s), it was actually a very easy weeknight dinner. Serve with a simple green salad to round out the meal. Lightly drizzle the olive oil into a 13 by 9 by 2-inch baking dish. Whisk the onion, parsley, egg, ketchup, garlic, salt, and pepper in a large bowl to blend. Stir in the cheese and bread crumbs. Mix in the turkey. Cover and refrigerate the turkey mixture. Using a melon baller or spoon, carefully scrape out the seeds and inner flesh from the zucchini, leaving 1/8-inch-thick shells. Be careful not to pierce through the skin. Fill the zucchini and pepper halves with the turkey mixture, dividing equally and mounding slightly. Arrange the stuffed vegetables in the baking dish. Pour the marinara sauce over the stuffed vegetables. Bake uncovered until the vegetables are tender and beginning to brown and a thermometer inserted into the filling registers 165 degrees F, about 45 minutes. Transfer the stuffed vegetables to a platter and serve. Tim and my go-to delivery restaurant is a place called Good in the West Village. We typically order their crisp turkey scallopine with arugula, ricotta salata & lemon-caper vinaigrette. I think we are single-handedly responsible for it becoming one of Good’s most popular items on SeamlessWeb. Giada’s Turkey Milanese recipe seemed like it would be a good homemade version of our takeout favorite. I think I prefer Good’s version but this was delicious! The turkey cutlets were super crispy and flavorful. And, for all you moms out there, this is a very kid-friendly dish. 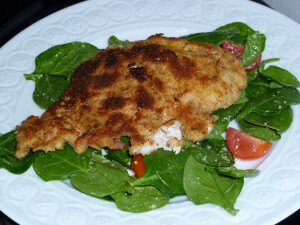 The kids may not love the arugula salad, but I am sure they will love the cutlets! Using a meat tenderizer or a small, heavy-bottomed saucepan, pound the turkey until 1/8 to 1/4-inch thick. Combine the flour, 1/2 teaspoon salt and 1/2 teaspoon pepper in a medium bowl. Place the eggs in a second medium bowl. Place the bread crumbs in a third medium bowl. Season the turkey on both sides with salt and pepper. Dredge the turkey in the flour and shake off any excess flour. Dip the turkey into the eggs and then into the bread crumbs to coat. Heat the oil in a large skillet over medium heat. Cook the turkey, in batches, until golden brown and cooked through, 2 to 3 minutes on each side, adding more oil, if needed. Remove from the skillet and drain on paper towels. Arrange the arugula on a large serving platter and top with the tomatoes. Drizzle with olive oil and season with salt and pepper, to taste. Arrange the turkey on top of the tomatoes. Using a vegetable peeler, shave the Parmesan over the turkey. Serve with lemon wedges on the side. Note: I halved the recipe. 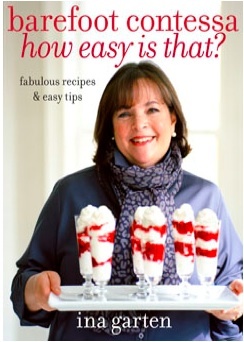 Barefoot Contessa's New Cookbook, "How Easy is That?" I received the latest Barefoot Contessa cookbook, How Easy is That, for Christmas. As usual, it is beautifully photographed and full of flavorful but simple recipes that rely on good quality, fresh ingredients. I don’t think there was a single recipe in the book I wouldn’t want to make (or eat). I’ve already cooked a couple of the dishes — the Lemon Chicken Breasts and the Weeknight Bolognese (recipes are below). The lemon chicken was so simple yet so packed with garlicky, lemon goodness! I used bone-in, skin-on breasts because I have never seen boneless, skin-on breasts and did not want to do any butchering. The chicken cooks at 400 degrees which is a great temperature for roasting some veggies as a side. I served with some Brussels sprouts and crusty bread. The sauce is definitely dip worthy. I also used some of our endless ground beef from the half-steer to make the Weeknight Bolognese. The only changes I made to the recipe were to use a can of whole tomatoes and penne because that’s what I had in the pantry. The sauce was so delicious and tasted like it had been simmer for hours. We had a nice simple antipasto with the bolognese for a quick Italian feast. I really love the Barefoot Contessa and would love to be a guest of Ina’s at her beautiful Hamptons home. She always makes her guests feel so welcome, sets a stunning table, and makes comforting dishes that rely on seasonal ingredients. Alas, until Ina discovers the Weeknight Gourmet, trying more of Ina’s delicious recipes from this gorgeous cookbook and, hopefully, being as gracious and relaxed a hostess as she will have to suffice. Copyright, 2010 Barefoot Contessa, How Easy is That? Warm the olive oil in a small saucepan over medium-low heat, add the garlic, and cook for just 1 minute but don’t allow the garlic to turn brown. Off the heat, add the white wine, lemon zest, lemon juice, oregano, thyme, and 1 teaspoon salt and pour into a 9 X 12-inch baking dish. Heat 2 TB of olive oil in a large (12 inch) skillet over medium-high heat. Add the ground beef and cook, crumbling the meat until the meat is no longer pink and has started to brown. Add the garlic, oregano, and red pepper flakes and cook for 1 more minute. Pour 1 cup of the wine into the skillet and stir to scrape up any browned bits. Add the tomatoes, tomato paste, 1 TB salt, and 1 ½ tsp pepper, stirring until combined. Bring to a boil, lower heat, and simmer for 10 minutes. Meanwhile, cook the pasta according to the directions on the box. Finish the sauce while the pasta cooks. Add the nutmeg, basil, cream, and the remaining ¼ cup wine to the sauce and simmer for 8-10 minutes, stirring occasionally until thickened. When the pasta is cooked, drain and pour into a large serving bowl. Add the sauce and ½ cup Parmesan and toss well. Serve hot with Parmesan on the side.